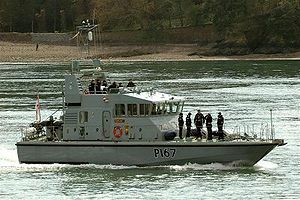 For other ships of the same name, see HMS Exploit. HMS Exploit is an Archer-class (or P2000) patrol and training vessel of the British Royal Navy, built in Woolston by, Vosper Thornycroft and commissioned in 1988. She was originally ordered for the now defunct Royal Naval Auxiliary Service (RNXS) and had a distinctive black hull like other RNXS vessels. She is currently is attached to Birmingham University Royal Naval Unit (URNU), that exists to provide training to undergraduate students in a wide range of naval skills and to provide opportunities for personal development. The ship's company consists of a permanent staff of the commanding officer, two senior rates and two junior rates, but can take up to twelve students with training officers usually embarked when conducting navigational training. Whilst at sea, students are able to put into practice navigation and seamanship skills they have learnt in the classroom during weekly training nights. These include chart planning, acting as Officer of the Watch, using the ship's radar and carrying out seamanship evolutions from anchoring to securing alongside. Instruction is given in engineering, firefighting, damage control and ship handling. 'Sea weekend' training is usually limited to visiting UK coastal ports but recent Easter and Summer deployments have included visits to France, Holland, Belgium, and the Channel Islands. The ship is based in Penarth Marina, Cardiff. HMS Exploit departing Portsmouth Naval Base 12th July 2010. Royal Navy official HMS Exploit page. Birmingham Universities Royal Naval Unit Student's Page. 40px This article about a specific naval ship or boat of the United Kingdom is a stub. You can help Ship Spotting World by expanding it. This page was last edited on 5 August 2010, at 23:08.